Considered to be one of the most beautiful and graceful of all wild cattle species, the banteng is most likely the ancestor of Southeast Asia’s domestic cattle. 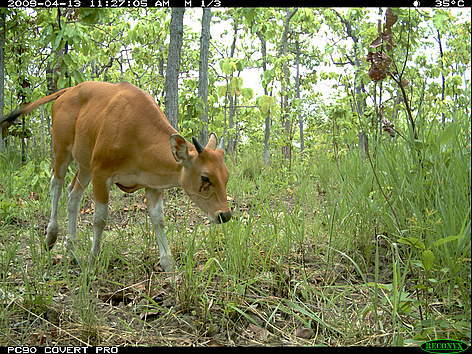 In Cambodia, banteng populations have decreased dramatically by about 95% between the late 1960s and the early 1990s. Between the 1990s and the present a decline of over 50% took place fin the country. Today, the most significant population in Cambodia (several hundred individuals) remaines that in the Eastern Plains Landscape, where protection efforts have probably stabilised declines locally. However, this banteng population is under considerable pressure from habitat loss and hunters as is evident from confiscated banteng trophies and meat. Diseases and parasites from domestic and feral livestock pose further serious threats to banteng survival. As a result, WWF is enforcing a ban of all domestic cattle in the strict protection zones of Mondulkiri Protected Forest and Phnom Prich Wildlife Sanctuary. 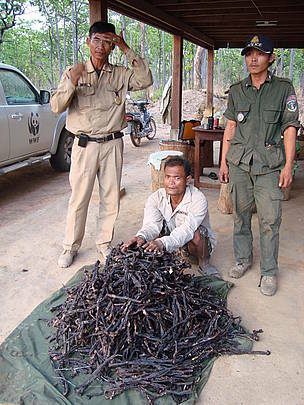 Offender with 25kg of dried banteng meat after being arrested close to Trapeang Trach outpost in northeastern Cambodia's Mondulkiri Protected Forest by a WWF-supported patrolling team led by Ten Sera (standing, left), ranger with Forestry Administration.